Many years ago I wanted to write something that I could use in University tutorials which would explain how to carry out scientific research; to describe the logic, the philosophy, and the method. Then I read ‘Zen and the Art of Motorcycle Maintenance’ and found that Robert M. Persig had written it for me. So here are some extracts from his book. Remember, Persig is using the motorcycle as his practical physical example; but what he says is generally true. Just change the text: for motorcycle read mayfly, marigold, meristem, mitochondrion or morphogen. It doesn’t matter. It’s the approach that counts. ‘Two kinds of logic are used, inductive and deductive. Inductive inferences start with observations of the machine and arrive at general conclusions. For example, if the cycle goes over a bump and the engine misfires, and then goes over another bump and the engine misfires, and then goes over another bump and the engine misfires, and then goes over a long smooth stretch of road and there is no misfiring, and then goes over a fourth bump and the engine misfires again, one can logically conclude that the misfiring is caused by the bumps. That is induction: reasoning from particular experiences to general truths. Deductive inferences do the reverse. They start with general knowledge and predict a specific observation. For example, if, from reading the hierarchy of facts about the machine, the mechanic knows the horn of the machine is powered exclusively by electricity from the battery, then he can logically infer that if the battery is dead the horn will not work. That is deduction. Solution of problems too complex for common sense to solve is achieved by long strings of mixed inductive and deductive inferences that weave back and forth between the observed machine and the mental hierarchy of the cycle found in the manuals. The correct programme for this interweaving is formalized as scientific method. Actually I’ve never seen a cycle‑maintenance problem complex enough really to require full‑scale formal scientific method. Repair problems are not that hard. When I think of formal scientific method an image comes to mind of an enormous juggernaut, a huge bulldozer ‑ slow, tedious, lumbering, laborious, but invincible. It takes twice as long, five times as long, maybe a dozen times as long as informal mechanic’s techniques, but you know in the end you’re going to get it. There’s no fault isolation problem in cycle maintenance that can stand up to it. When you’ve hit a really tough one, tried everything, racked your brain and nothing works, and you know that this time Nature has really decided to be difficult, you say "Okay, Nature, that’s the end of the nice guy," and you crank up the formal scientific method. For this you keep a lab notebook. Everything gets written down, formally, so that you know at all times where you are, where you’ve been, where you’re going and where you want to get. In scientific work this is necessary because otherwise the problems get so complex you get lost in them and confused and forget what you know and what you don’t know and have to give up. In cycle maintenance things are not that involved, but when confusion starts it’s a good idea to hold it down by making everything formal and exact. Sometimes just the act of writing down the problems straightens out your head as to what they really are. The logical statements entered into the notebook are broken down into six categories: (1) statement of the problem, (2) hypotheses as to the cause of the problem, (3) experiments designed to test each hypothesis, (4) predicted results of the experiments, (5) observed results of the experiments and (6) conclusions from the results of the experiments. The real purpose of scientific method is to make sure Nature hasn’t misled you into thinking you know something you don’t actually know. There’s not a scientist or technician alive who hasn’t suffered from that one so much that he’s not instinctively on guard. That’s the main reason why so much scientific information sounds so dull and so cautious. If you get careless or go romanticizing scientific information, giving it a flourish here and there, Nature will soon make a complete fool out of you. It does it often enough anyway even when you don’t give it opportunities. One must be extremely careful and rigidly logical when dealing with Nature: one logical slip and an entire scientific edifice comes tumbling down. In part (1) of scientific method, which is the statement of the problem, the main skill is in stating absolutely no more than you are positive that you know. It is much better to enter a statement "Solve problem: Why doesn’t cycle work?" which sounds dumb but is correct, than it is to enter a statement "Solve problem: What is wrong with the electrical system?" when you don’t absolutely know the trouble is in the electrical system. What you should do is state as the first entry of part (2) "hypothesis number one: The trouble is in the electrical system." You think of as many hypotheses as you can, then you design experiments to test them to see which are true and which are false. This careful approach to the beginning questions keeps you from taking a major wrong turn. Which might cause you weeks of extra work or can even hang you up completely. Scientific questions often have a surface appearance of dumbness for this reason. They are asked in order to prevent dumb mistakes later on. Part (3), that part of scientific method called experimentation, is sometimes thought of by romantics as all of science itself because that’s the only part with much visual surface. They see lots of test tubes and bizarre equipment and people running around making discoveries. They do not see the experiment as part of a larger intellectual process and so they often confuse experiments with demonstrations, which look the same. A man conducting a gee‑whiz science show with fifty thousand dollars worth of Frankenstein equipment is not doing anything scientific if he knows beforehand what the results of his efforts are going to be. A motorcycle mechanic, on the other hand, who honks the horn to see if the battery works is informally conducting a true scientific experiment. He is testing a hypothesis by putting the question to nature. The TV scientist who mutters sadly, "The experiment is a failure; we have failed to achieve what we had hoped for," is suffering mainly from a bad scriptwriter. An experiment is never a failure solely because it fails to achieve predicted results. An experiment is a failure only when it also fails adequately to test the hypothesis in question, when the data it produces do not prove anything one way or another. Skill at this point consists of using experiments that test only the hypothesis in question, nothing less, nothing more. If the horn honks, and the mechanic concludes that the whole electrical system is working, he is in deep trouble. He has reached an illogical conclusion. The honking horn only tells him that the battery and horn are working. To design an experiment properly he has to think very rigidly in terms of what directly causes what. This you know (or guess) from the hierarchy of knowledge you have about the system. The mechanic knows the horn doesn’t make the cycle go. Neither does the battery, except in a very indirect way. The point at which the electrical system directly causes the engine to fire is at the spark plugs, and if you don’t test here, at the output of the electrical system, you will never really know whether the failure is electrical or not. To test properly the mechanic removes the plug and lays it against the engine so that the base around the plug is electrically earthed, kicks the starter lever and watches the plug gap for a blue spark. If there isn’t any he can conclude one of two things: (a) there is an electrical failure or (b) his experiment is sloppy. If he is experienced he will try it a few more times, checking connections, trying every way he can think of to get that plug to fire. Then, if he can’t get it to fire, he finally concludes that (a) is correct, there’s an electrical failure, and the experiment is over. ‘Hume had previously submitted that if one follows the rules of logical induction and deduction from experience to determine the true nature of the world, one must arrive at certain conclusions. His reasoning followed lines that would result from answers to this question: Suppose a child is born devoid of all senses; he has no sight, no hearing, no touch, no smell, no taste ‑ nothing. There’s no way whatever for him to receive any sensations from the outside world. And suppose this child is kept alive in this state for eighteen years. The question is then asked: Does this eighteen year‑old person have a thought in his head? If so, where does it come from? How does he get it? In his ‘Critique of Pure Reason’ Kant tried to save scientific empiricism from the consequences of its own self‑devouring logic. He starts out at first along the path that Hume had set out before him. "That all our knowledge begins with experience there can be no doubt," he says, but he soon departs from the path by denying that all components of knowledge come from the senses at the moment the sense data are received. "But though all knowledge begins with experience it doesn’t follow that it arises out of experience." Kant says there are aspects of reality which are not supplied immediately by the senses. These he calls a priori aspects of knowledge. An example of a priori knowledge is "time". You don’t see time. Neither do you hear it, smell it, taste it or touch it. It isn’t present in the sense data as they are received. Time is what Kant called an "intuition", which the mind must supply as it receives the sense data. ‘Poincaré proceeded to examine facts critically. ‘Which facts are you going to observe?’ he asked. There is an infinity of them. There is no more chance that an unselective observation of facts will produce science than there is that a monkey at a typewriter will produce literature. The same is true of hypotheses. Which hypotheses? Poincaré wrote, "If a phenomenon admits of a complete mechanical explanation it will admit of an infinity of others which will account equally well for all the peculiarities disclosed by experiment". If the scientist had at his disposal infinite time, Poincaré said, it would only be necessary to say to him; "Look and notice well"; but as there isn’t time to see everything, and as it’s better not to see than to see wrongly, it’s necessary for him to make a choice. This is not a random choice. The more general a fact, the more precious it is. Those which serve many times are better than those which have little chance of coming up again. Biologists, for example, would be at a loss to construct a science if only individuals and no species existed, and if heredity didn’t make children like parents. Which facts are likely to reappear? The simple facts, How to recognise them? Choose those that seem simple. Either this simplicity is real or the complex elements are indistinguishable. In the first case we’re likely to meet this simple fact again either alone or as an element in a complex fact. The second case too has a good chance of recurring since nature doesn’t randomly construct such cases. Where is the simple fact? Scientists have been seeking it in the two extremes, in the infinitely great and in the infinitely small. Biologists, for example, have been led to regard the cell as more interesting than the whole animal, and molecules as more interesting than the cell. The outcome has shown the wisdom of this, since cells and molecules belonging to different organisms have been found to be more alike than the organisms themselves. How, then, to choose the interesting fact? Method is precisely this choice of facts; it is needful, then, to be occupied first with creating a method; and many have been imagined since none imposes itself. It’s proper to begin with the regular facts, but after a rule is established beyond all doubt, the facts in conformity with it become dull because they no longer teach us anything new. Then it’s the exception that becomes important. We seek not resemblances but differences, choose the most accentuated differences because they’re the most striking and also the most instructive. We first seek the cases in which our general rule has the greatest chance of failing; by going very far away in space or in time, we may find our usual rules entirely overturned, and these grand overturnings enable us the better to see the little changes that may happen nearer to us. But what we ought to aim at is less the recognition of resemblances and differences than that of likenesses hidden under apparent divergences. Particular rules may look at first discordant but looking more closely we see in general that they resemble each other; different as to matter, they are alike as to form, as to the order of their parts. When we look at them with this bias we shall see them enlarge and tend to embrace everything. And this it is that makes the value of certain facts that come to complete an assemblage and to show that it is the faithful image of other known assemblages. No, Poincaré concluded, a scientist does not choose at random the facts he observes. He seeks to condense much experience and much thought into a slender volume. Then Poincaré illustrated how a fact is discovered. He had described generally how scientists arrive at facts and theories but now he penetrated narrowly into his own personal experience with the mathematical functions that established his early fame. For fifteen days, he said, he strove to prove that there couldn’t be such functions. Every day he seated himself at his work table, stayed an hour or two, tried a great number of combinations and reached no results. Then one evening, contrary to his custom, he drank black coffee and couldn’t sleep. Ideas arose in clouds. He felt them collide until pairs interlocked, so to speak, making a stable combination. The next morning he had only to write out the results. A wave of crystallization had taken place. The true work of the inventor consists in choosing among combinations of facts so as to eliminate the useless ones, or rather, to avoid the trouble of making them, and the rules which guide the choice are extremely fine and delicate. It’s almost impossible to state them precisely; they must be felt rather than formulated. Poincaré hypothesized that this selection is made by the ‘subliminal self’ an entity that corresponds with a sort of subconscious awareness. The subliminal self, Poincaré said, looks at a large number of solutions to a problem but only the interesting ones break into the domain of consciousness. Solutions are selected by the subliminal self on the basis of "beauty" or "elegance", of the harmony of form and structure. This is not romantic beauty, the beauty of appearances which strikes the senses; but classic beauty, which comes from the harmonious order of the parts. It is the quest for this special classic beauty, the sense of harmony of nature which makes us choose the facts most fitting to contribute to this harmony. It is not the facts but the relation of things that results in the universal harmony that is the sole objective reality. There it is then, the bottom‑line advice to the would‑be scientist: pursue your science methodically, select your facts by reference to your a priori concepts (it goes without saying that you have to read the literature relevant to your topic to establish those a priori concepts), and then fit your own discoveries into the picture so as to make a harmonious whole. Harmony and quality = beauty; and that’s why science, good science, is an art. Extracts reprinted with permission of The Bodley Head from Zen and the Art of Motorcycle Maintenance by Robert M. Persig [view on Amazon]. 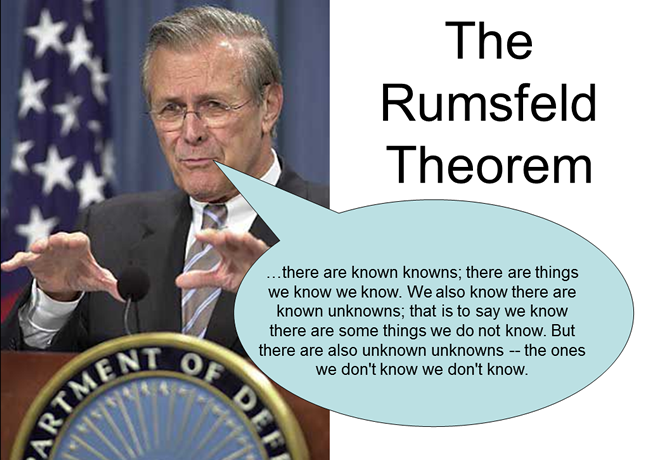 Feb. 12, 2002, US Department of Defense news briefing: Donald Henry Rumsfeld (born July 9, 1932) the 13th US Secretary of Defense under President Gerald Ford from 1975 to 1977, and the 21st Secretary of Defense under President George W. Bush from 2001 to 2006. At the time, this statement was regarded by many people (particularly journalists) as completely ridiculous, but it isn’t ridiculous at all. It’s actually a rather brilliant statement of what we know about things and what we don’t and so on. It puts into the minimum of words how life is, and how science views the world. David Moore; written July 1981, revised April 1988, September 2007 and December 2016.